baker puts a coin into the dough before baking the cake. 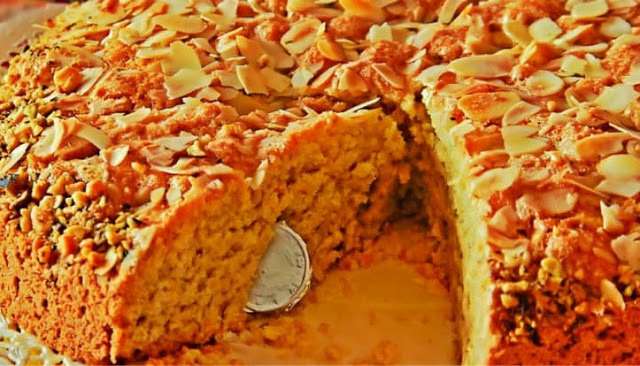 The person who finds that coin in his or her piece of Vasilopita cake receives a gift from the host of the house. 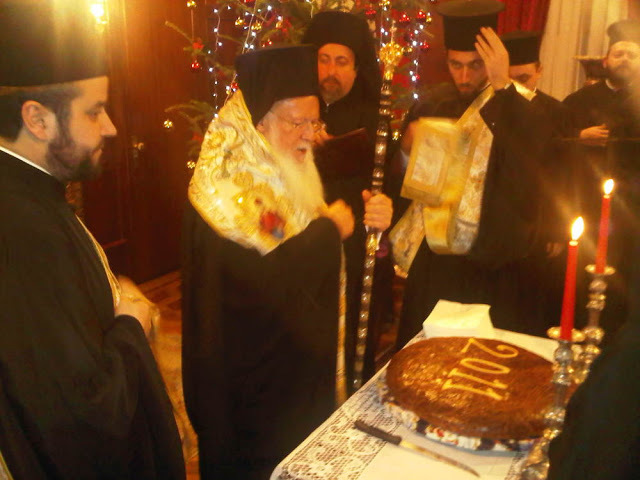 The Vasilopita tradition has its roots in the life of St Basil the Great.” (Fragment of the book “Monastic Pastry and Other Recipes” written by Archimandrite Demetrios Kavvadias). 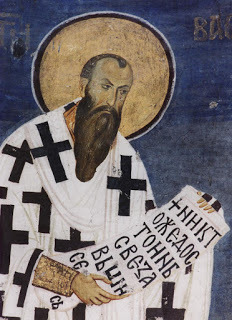 St Basil is known to have been elected by local bishops as the Archbishop of Caesarea and Cappadocia by God’s will, which was revealed to his predecessor Eusebius, and according to the general consent of the laity. He was a worthy pastor of his flock, notable for his preaching, writing, charity, and missionary work. This is why he bears the honorary title “the Great”. His old friend from Athens University, Emperor Julian the Apostate, visited him during his archpastoral ministry. The emperor was at war with Persians at the time. The holy hierarch deemed it appropriate to greet the great ruler at the city gates. He did not have anything but three loaves of barley bread — his regular food — so he gave them to the money-loving king. When the emperor saw the bread, he laughed and ordered his soldiers to collect some hay in the fields and bring it to the archbishop. Saint Basil humbly remarked that each person gives to the other what he eats. The infuriated king promised that he would return to the city on his way back from Persia to punish the archbishop, hold all residents of the city captive, and burn the city down. 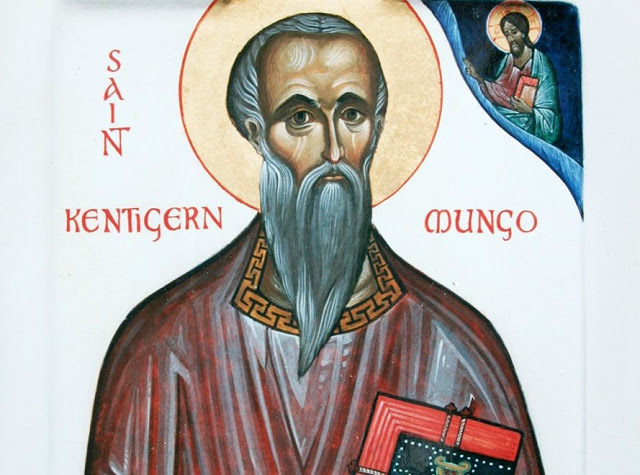 Saint Basil immediately left the city to pray fervently, having asked his flock to collect all gold and jewellery in anticipation of the king’s return: as soon as they would learn that the king was near, they would throw that gold under his feet to soothe his anger and rescue their lives. All residents of the city, led by St Basil, climbed a mountain called Twins Mountain (it had received this name because it had two tops) near Caesarea. There was a church in honour of the Most Holy Theotokos. The faithful started praying with tears. It was then that the Queen of Heaven appeared to St Basil. She sat on a golden throne with hosts of Angels around her. 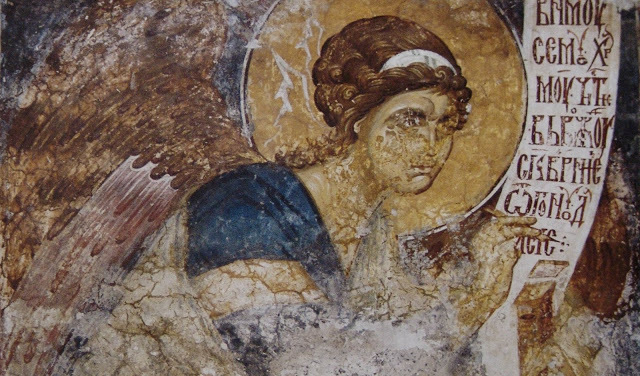 He heard Her command the Angels, “Tell Mercurius to go and kill Julian, my enemy.” Great Martyr Mercurius, wearing armour and carrying a sword and a spear, appeared, received the order from the Theotokos, and quickly disappeared. When St Basil came round after this unusual apparition, he went down to the city, accompanied by his clergy, to visit the church in honour of St Mercurius and to venerate his relics. St Mercurius had been martyred on that place one hundred years before, during Emperor Valerian’s reign. His relics and his armour, venerated by Christians, were on display in that church. When St Basil entered the church to venerate the relics, he saw that the reliquary was empty. Only then did he realise that the vision had been authentic and praised the Lord. The news from the battlefield were encouraging, too: the impious king was killed on that very night. Saint Basil climbed the mountain in a hurry to inform his flock about the news. He ordered the city dwellers to return to their houses fearlessly and to take back the gold and the jewellery that they had donated. However, the locals refused to take back their donations and insisted that St Basil dispose of the wealth as he pleased. 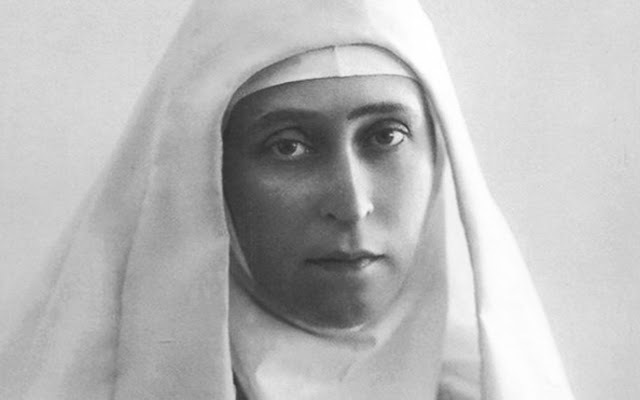 Upon contemplation, the saint ordered each person to take back ? of their donations, and used the remaining money to build almshouses, hospitals, orphanages, and homes for the elderly. How could he figure out how much money he had to give back to whom? St Basil ordered his deacons to make some dough and put some things of his choosing inside. After the Sunday Divine Liturgy, St Basil distributed the loaves of bread, and everyone was happy thanks to his blessing  because they found precious gifts inside the loaves as the antidoron of their donations that they made for the sake of God’s love. The Greek Orthodox Church follows New Julian Calendar. (Translator’s Note). 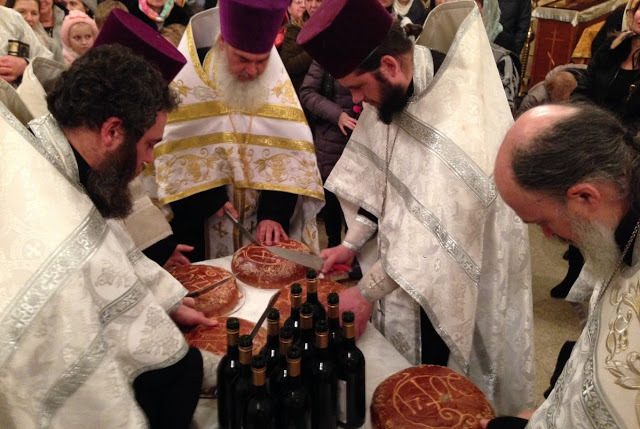 According to the Greek tradition, the faithful receive antidoron (the remaining part of the Lamb) after a Divine Liturgy. (Translator’s Note).